I know Thanksgiving is still days away, but you can’t help feel the holiday vibes starting sprinkle in throughout the neighborhood. Soon the famous Castle Rock Star will be lit and shining over the town. In The Meadows, the holidays are a special time, everyone steps up the decorating, and there are plenty of events happening to keep the season’s spirit alive. One special event in particular, will have you and your kids full of holiday cheer. Come to see Santa and Mrs. 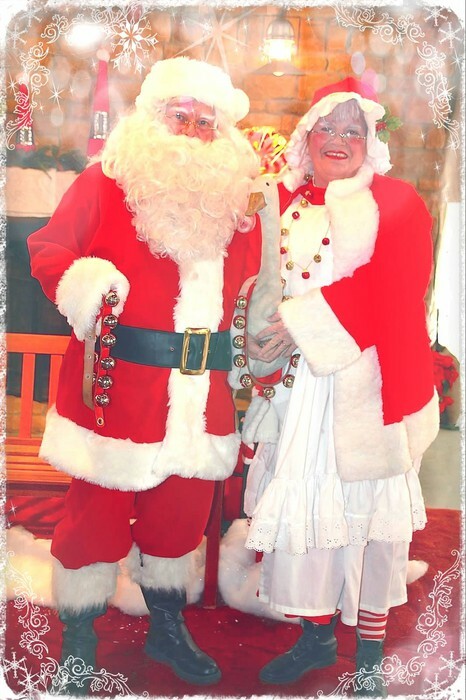 Clause at The Grange during the Holiday in The Meadows celebration on Saturday, December 1 from 10 am – 3 pm. Santa and Mrs. Clause will make an appearance so that your kids can get a special chance to tell the big man their Christmas wishes. A photographer will be on site taking free family pictures with Santa and Mrs. Clause so that you can save the holiday memory. Of course, seeing Santa is the highlight for any child, but while you’re there, you can also enjoy singing holiday favorites with carolers, holiday treats, coffee, hot cocoa, and plenty of holiday crafts. Holiday in The Meadows is one of the most popular events in the neighborhood and parking can be a bit tight at The Grange. If you can’t find a spot at The Grange, don’t let that ruin your holiday spirit. There’s plenty of parking at Paintbrush Park. Just park there and hitch a free ride to The Grange on the town trolley! The trolley will be running continuously throughout the event until 3 pm. The holidays are a time to help others in need. You can help others during this event by bringing a new pair of socks to donate to The Sock It To ‘Em campaign. This campaign provides socks for the homeless. Don’t miss Holiday in The Meadows. Visit with Santa, Mrs. Clause, and all of your neighbors. It’s going to be a wonderful time on Saturday, December 1 from 10 am – 3 pm. The Meadows is full of holiday events and activities, as I said, we celebrate in style. Learn about this and many of the other holiday events here. Of course, you can always check out the Meadows Facebook page for updates and pictures from each event.